It is my pleasure to share an interview with Mr. Bill Martinich, Mine Manager for the Moss Mine of Northern Vertex (TSXV:NEE). Mr. Martinich’s appointment was announced on September 29, 2017 in what was the 22nd news release from the company in 2017. If you think 2017 was a busy year, then just wait for 2018! Peter Bell: Hello Bill. Thanks very much for talking with me. It's not everyday that a Mine Manager gets to speak publicly and I appreciate you talking with me. Bill Martinich: You're welcome, Peter. At one mine I worked at in Nevada, every other manager was on the safety video except me. They finally got me to appear on it after two years and it was okay. Peter Bell: Thanks again for indulging me. Lots to talk about, but one thing I’ve been impressed by are these aerial photos of the site that show how it has changed over time. Bill Martinich:	I am so glad we have the historic photos of the Moss Mine. I try to get photos like that at every place I have ever worked because they are so important. Aerial photographs are particularly useful, but most places on take them on an annual basis. You can see the mine grow a bit with that, but it’s quite sparse. With drones and everything now, the technology is so cheap that you can do it every day if you really want to! Just look at Google Earth – you may not see a new image when you visit the website, but they do it every day. You can get it if you pay for it. Many people don't know that. Peter Bell:	I was wondering about that myself, Bill. I thought, "what’s the difference between the Google Map view of the site right now and what it looks like on the ground right now?" There is a company called Orbital Insight that is doing some wild things with satellite imaging to estimate economic activity more quickly than anyone else. They can track activity on shipping routes and even estimate how full a particular cargo ship may be based on its shadow. Aggregate all that information and you can get a very quick update on estimates on certain types of economic activity. Bill Martinich: It's data – there is all kinds of data we have now that we never used to have. Peter Bell:	Do you use these aerial photos at all in assessing progress at the mine? Bill Martinich:	I use it more as an educational map. It's a good holistic view to explain and discuss what is happening at site with different members of our team. It's a great overview of putting the place together how it goes. What I'm trying to do is keep the record of not just this month, but other months, so I can flip through it and show the chronology of it. Peter Bell:	Please keep taking these photos – they are great for the public, too. Bill Martinich:	Will do! And it's the same thing when I get on site – I snap pictures here and there, and dump ‘em into a catalogue with a date stamp. Those photographs are more relevant sometimes than others. For example, I haven’t been taking photos much with the crusher lately because it’s all put together now. When we were putting it together, you could see that it changed massively every two days or so. Now when I dive up there, my main impression is, "Okay, that's about the same – just more electric wire being pulled." Peter Bell:	And the paths through the pit are changing quite a lot right now, too. Bill Martinich:	Yes, those are changing around all the time. Now that everybody's out of the way, the mine is really going to take a totally different direction. It's going to start becoming a mine now, not a construction activity. Peter Bell:	And with the stockpiled ore, that can really go ahead immediately. Bill Martinich:	There's a lot of room for the stockpiled ore, now that we have the contractor who did the crushing for our Phase 1 mining in 2013 out of the way. That stockpile helps us do a lot of things, whether it’s to blend the grade or continue processing if there is a hiccup in the mining activity. I think a mine should always have at least a month of stockpile in front of you. Peter Bell:	Great. And is there space for all that at site? It's pretty tight layout up there. There's space now but there's going to be less as that pit grows. Bill Martinich:	There will be enough room for the stockpile of the ore, to say the least. As we get further down the mine life, that stockpile becomes less important. There is more ore coming out of stockpile at the beginning pit phases then in the future ones. Peter Bell:	And scheduling – are you planning to just going from west to east along the deposit, or are there some creative things you can do? Bill Martinich:	Right now, we are going to start with what I call the Center Pit. It's Hill 1 and Hill 2. We are starting there because that's where the best grade is located. We're spending everyone else's money and we want to pay them back immediately. After that, we plan to go to the Western Pit, then the Eastern Pit. All those pits are based on simple economics of which is the most viable from a net present value stance. Once I get a Mine Engineer on my team, things will get interesting. We can start to tweak things in the mine plan as you get away from the global perspective and frame things in terms of weekly production. That's where the fun is. Peter Bell:	I was impressed by how tight the mine site was. Your footprint is constrained because you are sticking to the patented claim for Phase 2, but everything has a logical flow. It's seem to be laid out very well. Bill Martinich:	It fits within the postage stamp. It is tight, but that can be a good thing. I've worked at a lot of places where you have all the room you could want, which leads you build things that you don't need. What do we need at Moss Mine? That's what's been built out there. Peter Bell:	Yes. And I could make sense of the layout of things, too. All the big parts, at least. Maybe not the crushing circuit – I was always a bit confused what went where in those crushers. "Okay, what's going on in there?" Bill Martinich:	Big rock becomes small rock. Bill Martinich:	Well, there are only seventeen belts now. With the contract crusher in Phase 1, there were well over twenty. Bill Martinich:	It's probably a little bit easier now than it was. And is certainly nothing compared to what it could've been. Peter Bell:	And how about the cone crushers? Are you happy about that? Bill Martinich:	It's better than the HDR technology that crushes them with drums. I think there are too many unknowns with that type of circuit. These are okay – I would say that they are standard practice in the industry. They're oversized for what we need, but that doesn't mean the wear package is going to be any better or any worse. We have some pretty hard material to process. It’s over-designed from a capacity stance. We will know what we have after we run material through it for at least a week. Then we can say if it is pretty good or not. That is where you bring in the operating team and fine tune it. Peter Bell:	And you can consider things like rock hardness or bond work index in the scheduling, too. Bill Martinich:	Our crushing manager has optimized those crushers before at several mines and that is his job here. Peter Bell:	It's good to have a team that is small and flat enough that he can talk to the person running the Merrill Crowe plant or doing the production geology. If he can have input on those decisions, then it can help everyone. I imagine some organizations do not encourage that kind of communication because of whatever hierarchy exists. There seems to be a lot of, "Thanks for your input, we're going to do what we're going to do and you do what we tell you." Bill Martinich:	I've worked for those organizations, Peter. You end up having four people to do the job of one. Peter Bell:	And the four manage to do a worse job than the one! Bill Martinich:	They spend money like they wouldn't believe. The best part is that they still don't know what they're doing. For us here, the crushing manager knows about most of the process all the way to the leach pad and the process manager knows most things from the leach pad to the plant. I have two guys looking at the pad, which I like. Nobody's right or wrong, but between them and myself we have a chance to get to the truth. That's what I'm trying to drive here for the culture. Nobody's right, but we can do it together. Peter Bell:	And building a culture is not the same as changing one. Bill Martinich:	The first thing written on my board, every place I've ever worked, "Safety is our culture. Production is our business." If you get the right team members in place, you do it right the first time. I've been to three different mines in my life to fix them and the problems are always based on the culture. Bill Martinich:	It's very simple to change the culture of a organization, but it takes two to three years. If you can create it right the first time, then we have the start of a great organizational culture right alongside a well-functioning mine. Bill Martinich:	Everybody does what they're supposed to do here. It's too small to get away from anything. I don’t think it’s about accountability. I believe that if I create my team the right way, then they're going to create their team the same way. And then you get more with less. Peter Bell:	It’s particularly important for you to get more with less because you have five years of production in Phase 2 now. With the ounces you have on the books now and production profile, there are a fair number of gold mining companies out there right and it’s always a question from the investing audience – "why should we get excited about this small production?" But it starts to become clear to me that if you do it right the first time, then you can go do it again somewhere else! Bill Martinich:	That's just what we're trying to show to the industry, Peter. We believe a junior mining company can actually do something that they say they're going to. We can take this operating model and bring it somewhere else. If it worked here, then why can't it work elsewhere? Peter Bell:	That's a tough story to convey to people, though. You have to appreciate the challenges of operating one of these businesses before you can really understand that. Bill Martinich:	Most of the people I've brought onboard came here for the same reason I did. We've worked for the larger mines, for better or worse, and we now have a different version of what we want to do. People will want to come here because they want a smaller mine mentality. The big mines are great, but they have a lot of bureaucracy. If people can come here and do a good job for a good company, then they will stay and your turnover will go to zero. Peter Bell:	And it’s possible to find and keep those good people because you're in mining country. Bill Martinich:	We are in the southwest United States, which is a great location to live and work. If I keep them happy and do what they're supposed to do, then there's no reason for them to pick up and leave. Keep in mind that a lot of them left their current jobs to come here, so it's happened before. Peter Bell:	Great. I feel like the gold mining industry needs a bit of a shakeup, too. There are big boys at the top and a bunch of wannabees at the bottom, but not a lot in between. It’s been a tough bear market for a long time and there hasn't been much value created for shareholders, but I think bull markets have to be driven by fundamentals to some degree. You need companies to demonstrate success to drive stocks. Bill Martinich:	The industry hasn't done itself favor in the last twenty years for a variety of reasons. In the tough times, they quit hiring people and then they don’t have new people to promote when the good times come again so they sometimes promote the wrong people. It always seems to be “hurry up or stop”. And that’s reflected in a lot of the share prices. What they have in the ground doesn’t matter as much as the quality of the business. Peter Bell:	It’s interesting to think about that in relation to Northern Vertex and what you have drilled off so far. It’s not a million ounces, but there appears to be a quality business taking shape here. That’s a good place to start. Then, I think about the fact that you can stand at the eastern edge of the deposit for Phase 2 mining and look past the fence of the patented claim onto the next hill 50 feet away – the outcrop continues. It’s not on the books yet, but it’s in the ground. Bill Martinich:	It crosses outside the patented claim, so we will drill that later. To think that we're only going to do Phase 2 and Phase 3 here is probably a mistake. When we look off to the west, the vein is still there. When we go to the east, it's still there. There's room for us to expand, but this is where we're at currently. That extends to the whole district! There's potential out there. It’s been estimated that there was 2.5 million ounces of gold taken from this area. What is left? Where is it? What's the driving factor behind the geology? If we get this mine running first and ring the bell to say, “We did it! We're a junior mining company that actually can do this.” Then, we can start expanding. Peter Bell:	The Moss Mine already had 200+ holes in it when Northern Vertex started working on it. They put another 450+ in it, I believe, but it almost seems like it was development-stage when you guys came in. That’s fairly different from what is much earlier stage exploration in the surrounding area. There are at lot of prospects that have never been drilled and never seen geophysical tests. No sampling or anything. The question becomes, "Can the company do that too?" 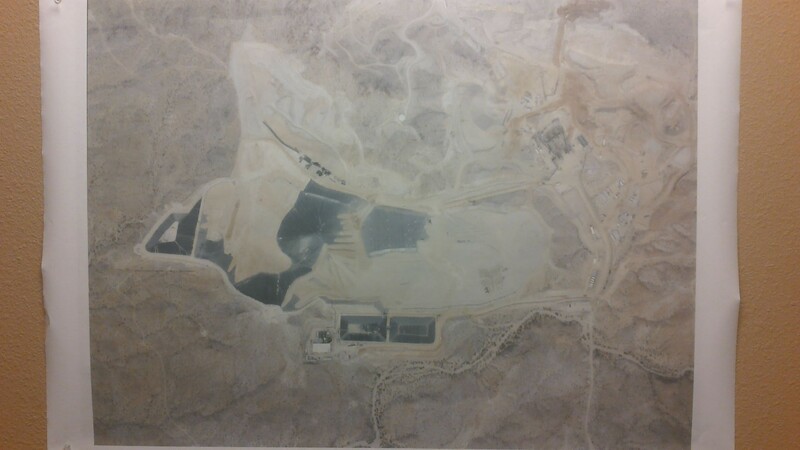 Bill Martinich:	I worked at a mine in Nevada and the company was selling this property for $10 million. Then, I showed up and a senior-level geologist showed up. We started putting all this data together and, next thing you know, the company is worth $100 million. Just because we looked at the data. The strike there was 8,700 feet long and 100 feet wide. There was gold at surface all over the place, but not a single drill hole within miles. That was fifteen years ago. Now, that property is owned and operated by Kinross, and it has a massive mine life. That is the story of mining. It starts with something really small, but you must have the right people in the right place at the right time. The data's there, but you need the people to be looking at the data. Everybody has a different version of what that the data is telling them, but somebody has to just look at it. For Northern Vertex right now, I feel like I've seen this movie before and it turns out well. Peter Bell:	Good to hear that you have this geological upside because one of Rick Rule’s phrases is, "Little mines can't make you big money". Bill Martinich:	We can make big money, but we have to go in steps. Our next step isn't to be a million-ounce producer. Let's try to become a 100,000-ounce producer first. Then a quarter-million, and so on. You have to build it up slowly. If not, then you lose track of what you're trying to do in terms of culture and you just become another mining company. You can lose your distinguishing features pretty quickly. Peter Bell:	Growth for growth's sake. Bill Martinich:	And you have potential of missing your metrics, right? There are not a lot of mining companies that the market really trusts in terms of what they say they are going to do. Peter Bell:	Well, let’s hope that you can become one of those few that does develop a good reputation in the markets. And you mentioned metrics – I wonder if there are any key data points that people should be looking at as you guys go into production here? Just standard operating statistics or something special that you’d like to draw people's attention to? Bill Martinich:	Once we pour gold, that's going to be a wake-up call for a lot of people. Nobody even seems to think this place exists. I think that when we get into full operating mode, it's not about the ounces as much as how effective the production is and how safe it is. If you can have a great safety record, a very low cash cost, and constant production with no blips, then that is different from everybody else. Peter Bell:	It occurs to me that the constant production is part operational, but part financial. You must have the operation dialed, but you also need the working capital. Bill Martinich:	Yes. You can't go up and down – you have to have a steady stream of production. And I think that goes back to the beginning of our conversation. The mine plan and the stockpile helps with that. We can keep a constant grade going heap. Peter Bell:	One little thing that jumped out at me from the feasibility study was that there's a stockpile at the end of the mine plan, too. I loved to see that at the start and the end of Phase 2. It seemed like you were setting yourselves up for success here. Peter Bell:	Bill, thanks very much for the conversation. What a pleasure to talk with you today. All the best for Northern Vertex in 2018! Bill Martinich:	Thank you, Peter. This document contains statements that are forward looking statements and are subject to various risks and uncertainties concerning the specific factors disclosed under the heading “Risk Factors” and elsewhere in the Company’s periodic filings with Canadian securities regulators. Such information contained herein represents management’s best judgment as of the date hereof based on information currently available. The Company does not assume the obligation to update any forward-looking statement.